This is an extinct volcano located on Uganda’s eastern border with Kenya. The mountain boasts numerous interesting features including gorges, ancient caves, waterfalls and hot springs. Birdlife is abundant on the mountain although various wildlife may also be encountered. Mt. Elgon is the fourth highest mountain in Eastern Africa, with the second-highest peak in Uganda (Wagagi Peak – 4321 meters). Mt. Elgon contains crater covering over 40 kms at the top of the mountain, surrounded by a series of rugged peaks. The ascent of Mount Elgon passes through a series of roughly concentric vegetation zones. The lower slopes of the mountain are intensively farmed up to the park boundary. The first zone of natural vegetation is montane forest which runs from the park boundary up to 2500m. this is followed by bamboo and low canopy forest (2400-3000m), then high montane health (3000-3500m) which includes the giant heather (Philipea excelsia) growing up to 6m tall. Above 3500m, cold temperatures and fierce winds force the heather to give way to open moorland. Finally, above 3800m, dramatic afroalpine vegetation is found among tussock grasslands and Carex bogs. This rare and spectacular vegetation type is restricted to the upper reaches of East Africa’s highest mountains and includes the giant groundsel (Senecia elgonensis) and the endemic Lobella elgonensisi. Mount Elgon supports a variety of wildlife including elepahant, buffalo, Defessa’s waterbuck, oribi, bushbuck, leopard and spotted hyena. 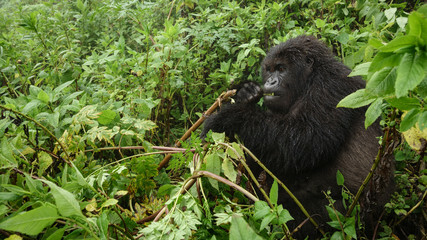 However, as usual in forest environment, most of these species are rarely seen. 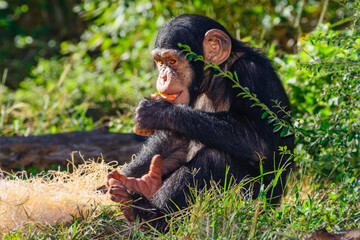 The most commonly seen creatures are black and white colobus, blue monkey, duiker and tree squirrel. The mountain is also home to 296 birds including 40 restricted range species. Birds whose Ugandan range is limited to Mount Elgon include Jackson’s francolin, moustached green tinkerbird, and black collared apalis, the Uganda ranges of which are limited to Mount Elgon. The bronze-naped pigeon, Hartlaub’s turaco and tacazze sunbird are limited to Mount Elgon and few other mountains in eastern Uganda. Mount Elgon is also one of the few places in Uganda where the endangered Lammmergeyer can be seen, soaring above the caldera and Suan gorge. Mount Elgon’s slopes are comprised of various caves left by moving lava and erosion of soft volcanic deposits that erupted some years back. The most accessible of these caves are Kapkwai Cave which is near the Forest Exploration Centre, and Khauka Cave on Wanale Ridge. Long ago, the precious features acted as shelters for livestock of the local people who were the traditional inhabitant of the Mountain. On later days the caves also provided manure in form of bat droppings and recently they are used by climbers and their porters as their resting grounds when hiking the mountain, also campsites have been set at the formerly Hunters Cave, Siyo Cave which is near the hot springs and Mude Cave, Tutum Cave are ideal for overnight expeditions. Jackson’s Pool which is said to be standing at 4,050m is a natural pool occupied by the shallow waters. The pool lies in the low land of the 4,165m high Jackson’s Peak, a free-standing volcanic plug rising from the western flank of the mountain. These physical features were named after the explorer Frederick Jackson, who in 1889 was the first European to climb Mount Elgon. The peak has traditional attachments to the locals since they use it as spot to communicate with their ancestors who left them long time. The peaks and the caldera. Mount Elgon’s highest peaks are formed by high points around a jagged rim enclosing one of the world’s largest calderas, at 40km long and 8km wide. The tallest peak is the 4,321m Wagagi, followed by Sudek (4,303m), Koitobos (4,222m) and Mubiyi (4,210m). 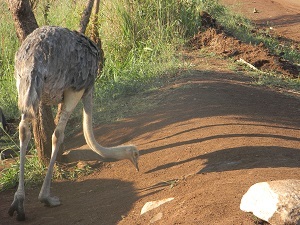 The Nabuyonga Trail is a 5km loop with birding, fauna and flora. Viewpoints overlook Mbale town, Lakes Kyoga, Bisina and Salisbara, and the rugged mountains in Karamoja region. 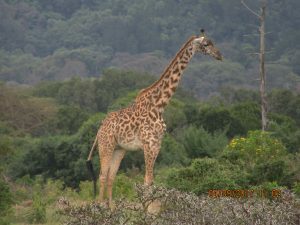 On a clear day, you may enjoy vistas of Wagagai peak and even areas of western Kenya. Beware of throwing a stone into the Nabuyonga stream – local folklore claims that if you do so, a thunderstorm will strike before you leave. 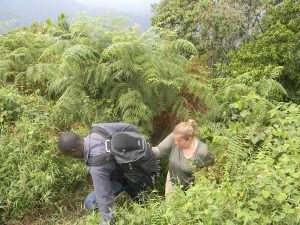 Visiting Mount Elgon National Park offers an impressing setting for extended hikes. In addition to the interesting and unique flora and fauna, you can expect to experience magnificent waterfalls, enormous caves, scenic peaks and gorges, and hot springs which bubble up at 48’C. The best times to visit are during the drier seasons from June to August and December to March. However, even in the wetter months trekking is manageable. No technical climbing equipping or skills are required, and all major peaks are accessible to hikers. There are two main trailheads (starting points) which lead to the mountain’s peaks. 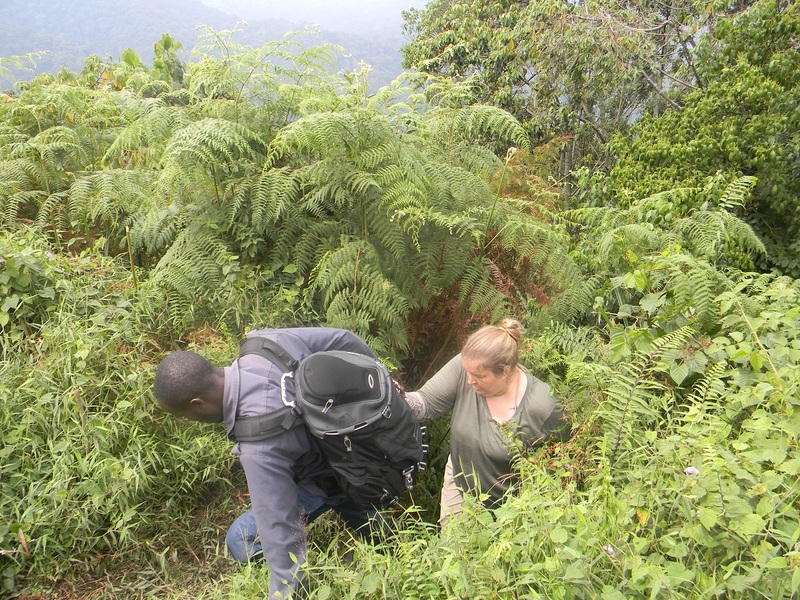 Salsa Trail (Buddukiro trailhead) is the most easily accessible from Mbale and is the most direct route to the peaks. It passes through the Park’s largest area of bamboo forest. However, it is also a steep and rugged climb of over 1600m on the first day. The other trail is the Piswa trail which is long and but gentle trail. The forest Exploration Center at Kapkwai is an excellent birding site where visitors can enjoy watching the unique bird species. The regenerating forest characterized with thick shrub along the loop routes extends to cover Cheptui Falls and these cool green environment favors the survival of the various bird species such as White-chinned Prina, African Goshawk, Chinspot Batis ,Chubb’s Cisticola, African Blue Fly-catcher, Dohertys and Luhders Bush-shrikes, Baglafecht Weaver, Cinnamon Bee Eater, Moustached Tinkerbird, Hartloub`s Turaco, Tacazze Sunbird, Olive- and Bronze-naped pigeons, Black Kite and Black-collared Apalis. The four hour mountain bamboo trails to Kapkwai Cave passes through tropical and bamboo forest. 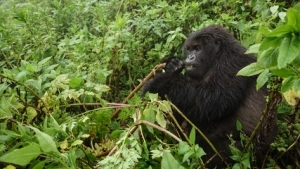 Along the trail are many primates, birds and rare trees such as Elgon teak and Elgon olive. The 5km walk to the Chebonet Falls and 3km walk to the Kapkwai caves follow the ridge view trail. There is also an 11km hike to the Tutum Cave, with the option of camping overnight beside the cave. Mountain biking trail runs from Sipi trading Centre to Chema Hill in Kapchorwa town. It should take 1.5 hours and provides views of various waterfalls and the Karamoja plains. Bikes can be hired from Sipi River Lodge. Over the past few years of exploring, a few main routes have been opened in the area, the nature of the routes are a downhill single track-mostly compacted local trials which are perfect for riding and most of the times always empty of people, Whilst mountain biking in Sipi falls is still in its infancy there is unlimited potential since it has the perfect terrain for all types of biking, another exciting possibility is to climb Mt.Elgon with bike. So if you are into your biking get yourself here for great unforgettable experience. Mount Elgon National Park lies 235km east of Kampala. Atarmac road runs through Jinja to Mbale town at the western base of Mount Elgon, before climbing to Kapchorwa on the mountain’s north-western flank. Murran roads lead off the Mbale-Kapchorwa road to reach the various trail heads. Simple accommodation facilities are available inside the Park at the Kapkwata Rest House and the Forest Exploration Centre at Kapkwai. Around Sipi area, there are lodges such as Sipi River Lodge, The Crow’s Nest Camp, Sipi Falls Resort, Lacam Lodge. In Kapchorwa, one can spend night in Masha Hotel, Noah’s Ark Hotel among others.